On The Road Hostel i Florianopolis, Brasilien : Boka nu! Good hostel! The staff was really helpful with translations and activities. Bedroom, kitchen, bathroom was all very clean. The bedrooms were a little small but okey overall. The breakfast was the only thing that wasn't that good but everything else was really good, so I would still very much recommend it! +Really cute dogs you could play with too. 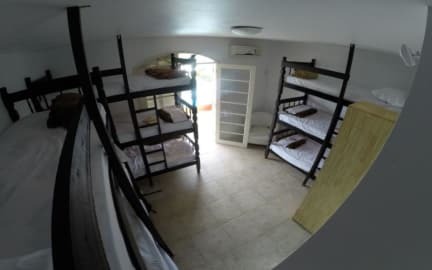 This hostel is 5 minutes walk from the beach. The staff was very friendly and nice, and tried to include all guests in activities. The kitchen was not well equipped and the common shelf was full of old ingredients. The breakfast was quite basic, white bread and fruit. The pool looked really nice and the garden was a nice place to hang out! There were lockers in the room. There were not much nice restaurants around and the closest supermarket was 15 minute walk away.